Mostly Pacific lowlands, Fl. in dry season, Dec.-Mar. The Bignoniaceae family should be familiar to anyone even from warm temperate climates where the orange-flowered Trumpet Vine is commonly planted. Costa Rica displays approximately 60 native species in this family, most of them, like the temperate Trumpet Vine are woody vines or LIANAS. 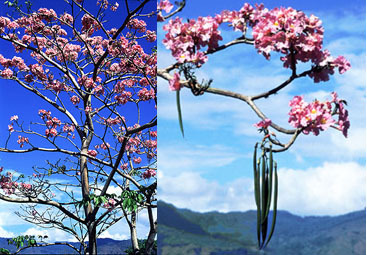 However, the trees in the family, particularly those in the genus Tabebuia, provide some of the most spectacular bursts of flowers to be seen anywhere. See more about this phenomenon under the yellow-flowered T. ocracea.